IBM found that 24 percent of online shoppers used mobile devices, compared to 14.3 percent in 2011. The iPad was used by 88.3 percent of tablet shoppers. As part of IBM’s Smarter Commerce initiative, the IBM Digital Analytics Benchmark revealed the following trends as of 12 a.m. PST. Holiday shopping is off to a good start, with a 17.4 percent increase in online shopping Thanksgiving Day and 20.7 percent growth on Black Friday versus 2011, according to data from IBM. Shoppers using mobile devices accounted for 16.3 percent of those sales, compared to 9.8 percent in 2011. IBM found that 24 percent of online shoppers used mobile devices, compared with 14.3 percent in 2011. Apple led the mobile shopping experience — the iPad was used by 88.3 percent of tablet shoppers, and the iPhone and iPad together were used in 18.5 percent of online shopping transactions. On Black Friday, nearly 60 percent used smartphones and 40 percent tablets to reach online retail stores. Home goods had a nearly 30-percent increase in Black Friday sales versus 2011. Social shopping appeared to dip from 2011, according to the IBM data, with a 35 percent decrease is Black Friday sales generated by social networks. However, social referral sales only accounted for .34 percent of overall Black Friday sales. IBM derived its analysis from tracking more than one million e-commerce transactions from 500 U.S. retailers, the company said. This Thanksgiving, see if these Android cooking apps can help you whip up a dinner worth celebrating. They offer recipes for the juiciest of turkeys, the silkiest of mashed potatoes, and more. Let’s be honest: family and friends are swell, but food is really the star of the show whenever the November holiday rolls around, right? That means that whether you’re celebrating at home or heading out to a potluck, the heat is on to make something oh-so-delicious for the festivities. To help you in your endeavor, we’ve got a list of our favorite cooking apps for the Android platform. They’ll not only help you find the best Thanksgiving recipes to get you started, but they’ll also provide you with some extra tools to get the cooking done more efficiently. If you’re a Food Network fanatic like I am, then In the Kitchen is the app for you. It gives you an extensive database of recipes straight from the kitchens of your favorite Food Network chefs, and all of it is easily navigable, thanks to some simple search and browsing tools. With In the Kitchen, you can run a search based on an ingredient or dish, or you can simply tap the image of your favorite chef to run through his or her favorite recipes. Some chefs have thousands of recipes listed in the app’s database, while others (Masaharu Morimoto) have only a few. Altogether, though, In the Kitchen offers more than enough recipes to keep you cooking a new dish every night for years. More than just a recipe database, though, In the Kitchen offers quite a few convenient tools to make your cooking experience easier. If you have an account, you can keep track of favorite recipes in your Recipe Box and add ingredients to a Shopping List in just a few taps. And even without an account, the app offers conveniences like a unit converter and a cooking timer. For this special holiday week, In the Kitchen has added a dashboard button that leads directly to a roundup of Thanksgiving dishes. Tap the link and you’ll see hundreds of recipes for turkeys, stuffing, potatoes, appetizers, pumpkin desserts, and even festive Fall cocktails. What’s nice is that the lists of recipes offer ratings, thumbnails, and cooking times, as well as the chef responsible. This way, it’s easy to quickly browse through these exhaustive lists, if you’re looking for, say, a turkey recipe that cooks in under three hours. If you want tried-and-true recipes by your favorite Food Network chefs for Thanksgiving, look no further than In the Kitchen for Android. With over 250,000 recipes, BigOven for Android offers the most complete cooking database I’ve seen in a mobile app. And with it’s nifty, tablet-optimized design, thumbnail-based pages, and menu of useful tools, it’s an absolute pleasure to sift through all of its delicious content. As with other cooking apps, you can search through BigOven’s recipes for specific dishes or ingredients, or you can browse by category. There are also a number of curated recipe collections, such as the Thanksgiving collection, which currently has recipes for turkeys (of course), pecan pie, pumpkin cheesecake, roast chicken, and perhaps the best dinner rolls you’ve ever tasted. There’s also a random recipe generator, which is neat but not very useful, if you ask me. One of my favorite features, though, is Search by Leftovers. With this tool, you can input as many as three ingredients you have in your kitchen, and search for recipes that require them. In addition to delicious recipes, BigOven offers tons of tools such as a grocery list, a menu planner, a favorites list, and more. With its incredible database and all of its extra conveniences, BigOven should probably be your bread and butter when it comes to cooking this holiday season. Cooklet is the final app on our list, and it’s a bit of a risk since it’s a young social platform that still has quite a few bugs. But even at such an early stage in its development, this app is worth mentioning as it is, hands down, the most beautifully designed cooking app I’ve seen. Optimized for a tablet, Cooklet features a two-panel layout, slick drag-and-drop functionality, and a number of visual details that add to an overall jaw-dropping interface. At its core, Cooklet is a social cooking platform. This means you can not only run a typical search for a dish or ingredient, but you can also browse through the recipe “books” of other users. Also, you can filter by meal type, cook time, or even difficulty. But my favorite way to use Cooklet is by swiping through the Inspiration page. Here, the app shows you streams of thumbnails for popular recipes on the network. You can click through to get details, or drag any thumbnail to your Favorites list or Shopping List. Again, it’s worth noting that Cooklet will not provide you with the smoothest of user experiences, because it is still a relatively buggy app. That said, I do have the utmost confidence that this title is going to get better. Check it out now, browse through its recipes, and keep an eye out for future updates. Need a quick hit of wireless Internet for your laptop when you’re out and about? 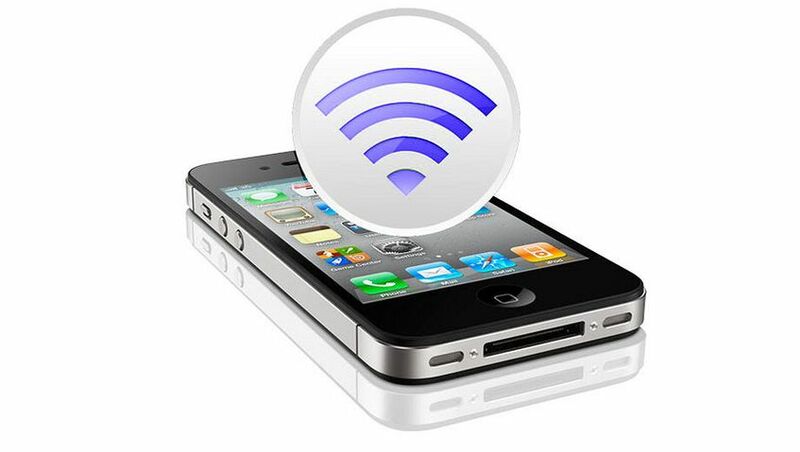 Here’s how to set up a “personal WiFi hotspot” – also known as ‘wireless tethering’ – on your iPhone 4 or 4S. You can also create a personal hotspot on the ‘new iPad’ (aka iPad 3) if you’re got a 3G iPad, thanks to a recent software update issued by Apple. 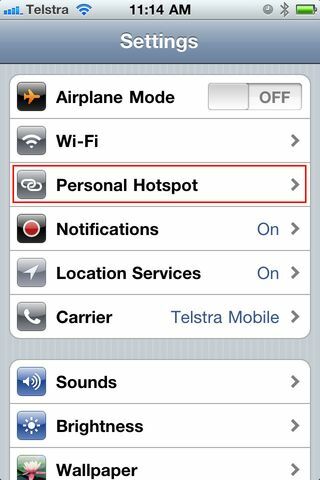 Sadly, the personal hotspot feature isn’t available on the iPhone 3G or 3GS or the original iPad or iPad 2. 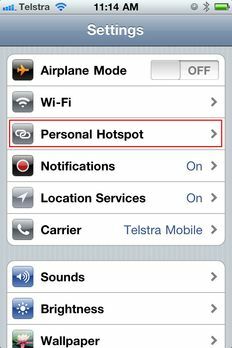 The personal hotspot feature turns your iDevice’s 3G signal into a short-range wireless hotspot, just like you’d find a cafe or hotel lobby. But unlike those open networks your iPad or iPhone hotspot comes with automatic password protection so that nobody else can hitch a free ride on your private wireless network. Up to five devices can connect to the net via your iPhone at once. That makes it ideal for connecting your laptop and a Wi-Fi iPad at the same time, for example, when you’re on the road. 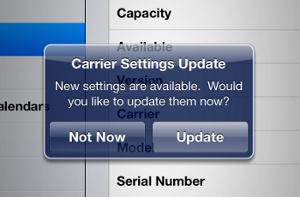 Here’s what you’ll see on your iPad’s screen when the new Apple software is made available over the 3G network. These instrutions apply to the new iPad as well as the iPhone 4 and 4S. In settings, you’ll see a ‘personal hotspot’ menu item. Tap it. 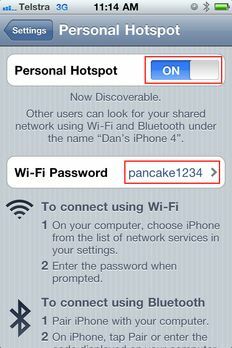 In the personal hotspot menu, slide the “personal hotspot” option to “on”. You’ll note that Apple has allocated the connection a default password which is shown on this screen too. 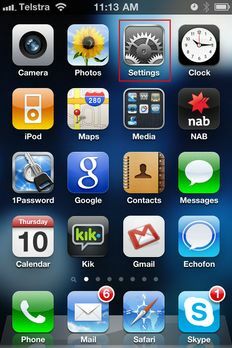 You can either use it (as each iPhone 4 gets a different random password) or change it to something you can more easily remember by tapping on it. Then, on your computer’s Wi-Fi menu, you should see your iPhone pop up in the list after a few seconds. 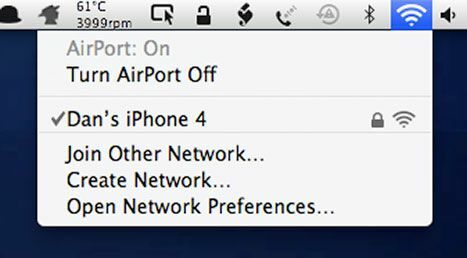 The network name is the name of your iPhone in iTunes — in our case, “Dan’s iPhone 4”. Once the network is selected and you’ve put in the password you selected in the last step (or Apple’s default password), you’ll be able to connect your tablet, laptop and any other Wi-Fi device to the net via your iPhone’s data plan. Bear in mind that the feature does tend to use up a fair bit of battery power, so use it sparingly if the phone is already on low battery power. If you’ve got the iPhone’s power adaptor handy and are near an AC powerpoint, plug in your iPhone to top up the battery while you work. Microsoft’s carefully timed unveiling of Windows 8 has been frustratingly incomplete. Today’s launch of the Release Preview fills in many of the missing pieces, with the biggest surprise being a rich and polished collection of Metro style apps. Microsoft publicly unveiled the Windows 8 Release Preview today. If you’ve been skeptical of Windows 8 so far, prepare to be surprised. Microsoft’s painstakingly staged reveal started with a Developer Preview last September, followed by a Consumer Preview at the end of February. Each milestone has unveiled new features, but the overall picture has been frustratingly incomplete. This milestone release fills in many of the missing pieces and offers a much more nuanced picture of what the final release will look like. I don’t expect it to silence the skeptics who think that the Metro-izing of Windows is a strategic blunder, a franchise killer that deserves a place alongside epic failures like New Coke and Star Wars: Episode 1. But if you’ve managed to retain an open mind about Windows 8, the Release Preview goes a long way toward making sense of Windows 8’s controversial design decisions. If Windows 8 were being developed like its predecessors, the pace of change would be decelerating rapidly at this point, and reviewers would be focusing on the minutiae of system-level tasks. Instead, Microsoft has quickened the development tempo dramatically. To understand why, you have to look at what makes Windows 8 so fundamentally different from its predecessors. Over the past two decades, Microsoft has released roughly a dozen major desktop versions of Windows. Each one has included a predictable mix: the core of the operating system, a collection of essential system utilities (think Windows Explorer and Control Panel), and a motley assortment of underpowered apps (Calculator and Paint being the canonical examples). Windows 8 turns that mix on its head. The underlying operating system is solid, reliable, full-featured, and impressively fast. But it’s no longer the star. The apps included with Windows 8 are the true stars of the new OS. Out of the box, a Windows 8 device will include a full suite of robust apps to handle communications (mail and messaging), digital media, and information. 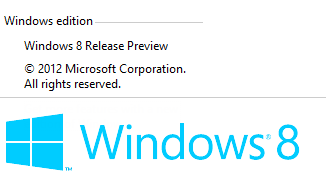 The built-in apps in the Windows 8 Release Preview are light-years ahead of the rudimentary “app previews” that were included with the Consumer Preview release. Collectively, they leverage Microsoft’s enormous multi-year investments in productivity software, digital media, and online services. 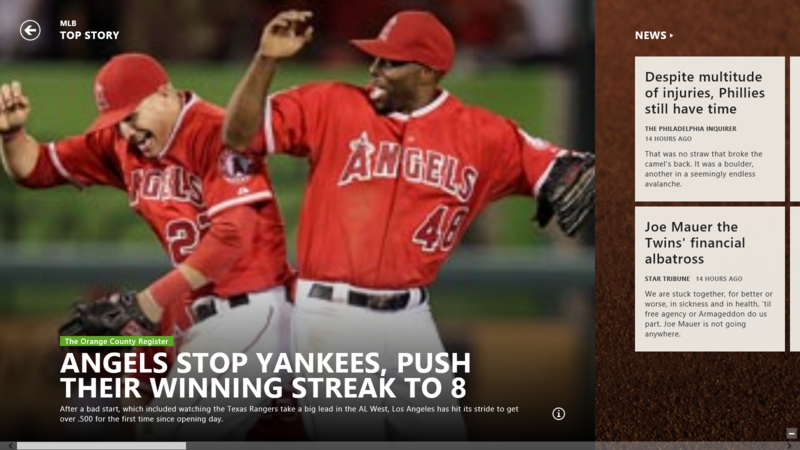 The biggest surprise is a trio of new Metro style apps that aggregate news, sports, and travel in a way that really shows what a well-designed Metro app is capable of doing. These apps, along with the previously released Finance and Weather apps, depend on an extraordinarily tight level of integration with Microsoft’s Bing search platform. I sat down with Microsoft’s user experience guru Jensen Harris earlier this week for a whirlwind demo of the Release Preview. For the past 24 hours I’ve been testing the new bits on a Microsoft-supplied Samsung Series 9 notebook. 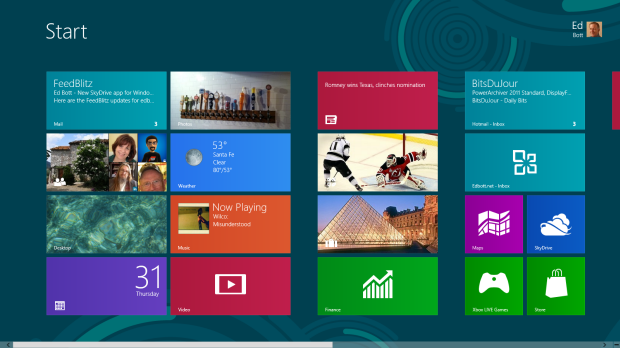 The basic Windows 8 interface is essentially unchanged from what we’ve already seen in the Consumer Preview. It’s more polished and subtly refined, with a number of usability tweaks that have already been documented on the Building Windows 8 blog. Anyone who was expecting Microsoft to bring back the Start button will be disappointed. The Windows Store won’t open for business until the Release Preview bits are publicly available, so I wasn’t able to install or use any third-party Metro style apps in my early testing. During the demo, however, I did see a selection of new Metro style apps that included two slick Twitter clients, a much-improved Amazon Kindle Reader, and a smart-looking Wikipedia app. I also saw numerous examples of apps that use the built-in contracts that are part of the Metro development framework—enabling apps to share data without any custom code. Microsoft’s new apps make extensive use of Metro features, including live tiles and snapped views, and many individual items can be pinned to the desktop. That makes the Metro style desktop in the Release Preview much less of a collection of brightly colored tiles and more of a continually updated dashboard. That trend is likely to continue with third-party apps. The Metro style digital media apps—Music, Photos, and Video—are significantly improved from the versions in the Consumer Preview. Windows Media Center has officially been yanked from this release. It’s unclear when the promised extra-cost upgrade will be available. See the final page of those post for details on how to enable it. The single biggest surprise in the Release Preview is that the Metro style version of Internet Explorer will include support for Microsoft-approved sites that use Adobe Flash. The Flash Player isn’t installed as a plugin but is instead a fully integrated part of the browser, managed and updated by Microsoft. It might not look much but New Star Soccer is a game that has had me addicted for the last couple of weeks. The basic arcade game is free and very simple. The object is to score as many goals as you can while more obstacles – defensive walls, high winds and so on – are put in your way. You drag an arrow to aim your shot then tap on a football to determine the height and degree of spin. Complicating matters is the need put aside some of your wages for lifestyle items – mobile phones, cars, even houses. Better houses will help you maintain your fitness, while lifestyle items will help you get a girlfriend, which will boost your happiness and help you to play better. You can even visit the casino if you want but be prepared for your reputation to take a knock if you are seen gambling too much. The game becomes about managing your resources in a bid to build your skills while keeping everyone happy. It’s a classic ‘just one more turn’ game that keeps you playing for hours. The graphics will look simple to younger gamers but those who grew up in the late 80s and early 90s will find them charmingly retro. There are in-app purchases that can add to your cash but though it’s tempting to take advantage of those early in the game, you don’t really need to. Patient progress will soon see your cash flow reach decent levels. If there’s a weakness, it’s that the game doesn’t really develop much after you’ve played three or four seasons. Shooting and passing remains about the same difficulty and keeping everybody happy can become a chore. However, you’ll find yourself spurred on by the attempt to get your skills to their maximum level or to get one more hattrick. There is always some little benchmark to aim at. Prepare to get addicted. If you’ve ever played Football Manager, The Sims or even Angry Birds, there’s a good chance that New Star Soccer will grab you and not let go. You’ll find yourself itching to play in every spare moment and anxiously checking your friends’ scores to see who has more international goals. It’s a wonderful little game but it will eat your life. Don’t say I didn’t warn you. New Star Soccer is available for iOS, Android Tablet and on PC.